Alumni from all classes reunited with current faculty, staff, and students for a fun-filled weekend featuring a baseball game at Camden Yards and brunch. Alumni and their families joined faculty, staff, and students at the University of Maryland School of Pharmacy on Sept. 16-17 for the School’s annual Homecoming and All Alumni Reunion Weekend. With activities spanning two days, the event offered numerous opportunities for attendees to reconnect and reminisce with friends and fellow classmates, while celebrating traditions, strengthening connections with the School, and creating new memories with family and friends. 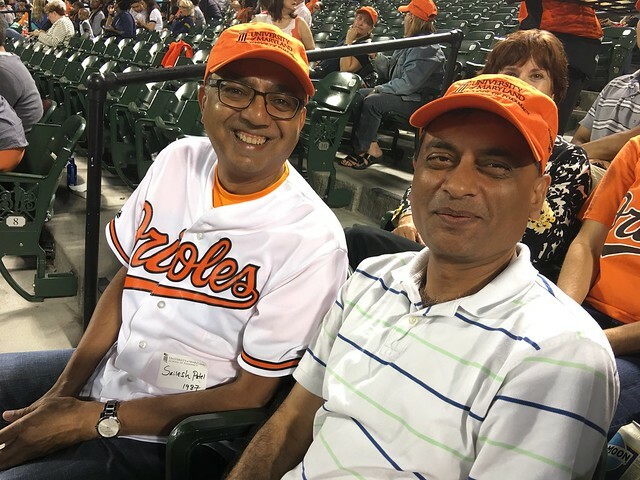 The reunion, which graduates from all years were invited to attend, kicked off on Sept. 16, with a cookout for alumni, family, and friends, followed by a trip to Camden Yards, where attendees rallied their support for the Baltimore Orioles as they took on the Tampa Bay Rays. The festivities continued on Sept. 17, with a scavenger hunt and brunch, during which milestone classes – including the Classes of 1956 and 1966, which celebrated their 60-year and 50-year reunions, respectively – were recognized. Later, attendees participated in a historical clinicopathological conference during which C. Daniel Mullins, PhD, professor and chair of the Department of Pharmaceutical Health Services Research (PHSR); Jill A. Morgan, PharmD, BCPS, BCPPS, associate professor and chair of the Department of Pharmacy Practice and Science (PPS); and Paul Shapiro, PhD, professor and chair of the Department of Pharmaceutical Sciences (PSC), joined historical experts for a pharmacological investigation into the mysterious death of author Edgar Allan Poe. An ice cream social offered a sweet ending to the weekend’s activities. View the gallery below for photos from this exciting, fun-filled event. Donations from more than 330 faculty, staff, students, alumni, and friends will help support critical programs at the School. Donations from nearly 200 faculty, staff, students, alumni, and friends raise more than $32,000 for the School. Event celebrates the official debut of the School’s new pharmapreneurism initiative and honors nine alumni for their unparalleled success as innovative pharmapreneurs.